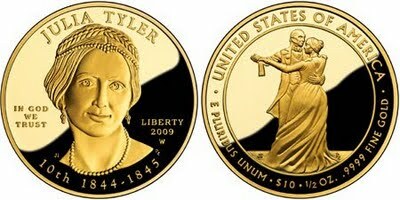 Today, August 6, 2009, sales of the Julia Tyler First Spouse Gold Coins and separate Bronze Medals will go on sale at the US Mint. This will mark the third release of the series for this year and the eleventh release overall. The obverse of the Julia Tyler First Spouse Coin features her portrait. The reverse of the coin features Julia and John Tyler together dancing at a formal White House event. Both sides of hte coin were designed by Joel Iskowitz and sculpted by Don Everhart. Coins will be available in either proof or uncirculated versions with the proof coins priced at $629.00 each and the uncirculated coins priced at $616.00 each. There will be an initial household ordering limit of ten coins per option per household. The bronze medal will feature a likeness of the design used on the gold coins with the removal of some inscriptions. The medals will be priced at $3.50 and will not have any ordering limits. The First Spouse Gold Coin series was created to honor the First Spouses of the United States by producing uniquely designed 24 karat one-half ounce gold coins. The series was launched in 2007 with releases for Martha Washington and Abigail Adams. This year’s releases include Anna Harrison, Letitia Tyler, Julia Tyler, Sarah Polk, and Margaret Taylor.